Photo courtesy of Webzer at Flickr.com. The ocean covers more than 70% of the earth’s surface, and it’s a major part of the ecosystem that we rely on. Phytoplankton are responsible for about half of the oxygen produced worldwide. More than 1 billion people rely on fish for a significant part of their diet. The ocean provides food, recreation, clean air, carbon mitigation, inexpensive transport, and many other things that we take for granted. Yet, we’ve been treating the ocean like a dump for centuries. That may have been fine when society produced trash on a very small scale and all of things we threw away were biodegradable, but technology has changed that. There are thousands of phantom fishing nets that keep killing fish after being abandoned. Sunken ships leak millions of gallons of oil and billions of styrofoam cups end up in the water every year. Even when these events happen thousands of miles away, they have a ripple effect that’s felt worldwide. The ocean is one continuous body of water. Each sea and bay is connected by strong currents and migrating animals. That means damage done to one part of the ocean will eventually affect all the connected bodies of water. After oil spills happen in the Arctic Ocean, traces of petroleum spread to the Atlantic, Pacific, and Indian Oceans too. The oceans are one of many areas around the world where the environment has a direct effect on human health and industry. For example, the rain forests convert carbon dioxide into oxygen and affect climate. Coral reefs nurture schools of fish and they offer passive protection to ports. The organisms that make these areas work are resilient – they’ve survived centuries of natural disasters such as hurricanes and wildfires. Yet some of these areas are under constant stress caused by humans. Stress factors that threaten wildlife include contamination of water supplies, climate change, human development, and invasive species. Abandoned mines are leaching hazardous chemicals into rivers and lakes. Mangrove forests are being cut down to build beach resorts. River deltas are clogging up with invasive species like zebra mussels and Wakame kelp. In the face of all these threats, what can we do? Here are a few steps that anyone can take to help protect the health of our oceans. In areas that have been fished out or poisoned by industry, native species have often been wiped out. But, that doesn’t mean that Cod have been permanently wiped out in the Atlantic, or that scallops will never return to the Virginia fisheries. Jennifer Rich is planting sea grass in an effort to restore the scallop breeding grounds of her home state. She led a volunteer effort off the coast of Virginia to replant eel grass in environmentally damaged areas. Her effort is ongoing, and similar replanting projects could use your help. Wetlands and mangrove forests are especially valuable because they filter sediment, pesticides, and fertilizer runoff before they get to the ocean. If you’d like to get your hands dirty in another way, plan a beach vacation off of the beaten path. Once a year, the Ocean Conservancy does a worldwide project to remove trash from the shore. Last year, volunteers cleaned up more than 30,000 miles of shoreline. In a single day, more than 7 million pieces of trash were collected for proper disposal. Check with your City Hall – many towns are happy to supply trash bins, rubber gloves, and even boats to anyone who wants to clean up local waterways. 2) Protect natural buffer systems. Biosystems are nature’s utilities – they desalinate water, absorb carbon, liberate nutrients from the ground, and provide other services free of charge. The plants and animals that make up these systems are often treated as commodities, but killing the goose that lays golden eggs will only put food on the table for a day. Protecting biosystems can pay dividends for years to come. Forests are an essential buffer for the oceans. Old growth trees neutralize the pH of rain and absorb harmful chemicals before they reach the ocean. Trees that grow in estuaries and along riverways are especially important, but those areas also face increased development pressure and they are easy for loggers to access. Shoreline habitat is being destroyed to build giant shrimp farms and resort hotels. Luckily, there are now sustainable forestry and aquaculture options available. Sustainable logging allows limited harvesting of resources without destroying the natural processes that we benefit from. The next time you buy lumber or land, do some research and check for certifications of sustainability. 3) Substitute organic fertilizer in the place of chemical fertilizers. When a lawn is overfertilized, the excess fertilizer will usually wash off into the surrounding environment. Fertilizer pollution causes eutrophication in waterways – it saturates the water and promotes algal blooms in nearby lakes. A significant amount of fertilizer runoff will eventually make it out to sea, where it can cause red tides and elevated amounts of harmful bacteria. Surprisingly, residential property has higher levels of fertilizer runoff per acre than agricultural land – possibly because farmers are smarter about how they use fertilizers. Using organic fertilizers, mulch, and compost can reduce these problems. Not only are these fertilizers slower releasing, but they also contain nutrients in forms that are more easily absorbed by plants. Chemical fertilizers have other problems too. They can form a crust on the top of soil that repels water (blocking soil absorption, increasing runoff, and promoting erosion). Some chemical fertilizers will also kill soil fungus, soil bacteria, earthworms and insects, all of which play a vital role in aerating the soil and helping anchor it to the ground. Plants have evolved to live in just about every area of the country. These native plants are adapted to local soil and weather conditions, so there’s very little need to fertilize or water them. Many beautiful native plants are available. A yard landscaped with unusual plants can really stand out, especially during a drought when all of the neighbors yards turn to dust. Using native plants to conserve water is known as Xeriscaping. It can be a very effective way to cut your yard’s pollution footprint, and xeriscaped lawns also offer natural habitat to native animals and migrating species. Since native plants are heat and drought tolerant, they also work year round to trap dust, block wind, and prevent erosion. When rain falls on bare ground, about 90% of the water is normally absorbed in the first 30 minutes. On developed land, the surface is usually covered with impervious materials such as asphalt, concrete, and cement. For every 20% of the ground that’s covered with impermeable surfaces, the amount of runoff will increase by roughly 100%. These impervious materials block water from soaking into the ground, but the water has to go somewhere. As a result, residential areas are prone to flash floods and rapid erosion which harm the water quality of nearby rivers and lakes. You can use this information to make smart landscaping decisions. Instead of putting a sidewalk in your garden, consider using flagstones or building a gravel pathway. If your driveway needs to be resurfaced, check into using permeable cement. There are even companies that build living rooftops – these green roofs not only help insulate your house, but they also protect your roof from heat damage, hail, UV degradation, and animal damage. Permeable areas act as natural buffers to pollution because they help contain runoff. Runoff is often caused by poor landscaping. Many older homes have design flaws that cause water to flow much faster than necessary. Not only are these flaws easy to fix, but reducing the speed of runoff will also protect your home from flood damage and erosion. On sharp slopes, you can grow plants with deep roots like prairie grass. Other solutions include placing bales of hay on the slopes to soak up the water or installing terraces. If your building has rain gutters, installing silt fences on the gutters will slow the speed of drainage and reduce the energy of flowing water before it reaches your foundation. If you want to make an even big difference, consider putting a rain barrel or rainwater garden under your downspouts. When planning these projects, make sure to check local building codes. It’s also important to schedule construction projects for months with low rainfall. While the projects are underway, there will be a lot of exposed soil that can be carried away. Tarps can be used protect bare ground, and sewing quick growing plants will quickly cover up any worrisome spots. Housepets are another major source of pollution – pet waste has concentrated forms of some toxic chemicals as well as harmful bacteria that can do serious damage to the ocean. Even the nutrients found in sewage can cause problems because they promote the growth of anaerobic bacteria. Anaerobic bacteria create an Anoxic zone of seawater, where all of the oxygen has been depleted and many organisms are unable to breathe. Dog droppings and cat poo contain many of the same pathogens that human waste does, such as e coli and salmonella. While human waste is at least partially treated in sewage processing plants, dog waste is often left to decompose wherever the dogs leave it. When it rains or the sprinklers turn on, harmful bacteria in pet waste is spread over the surface of your whole lawn. Runoff will carry this bacteria down the storm drains and eventually out to sea. One way to reduce the impact of pet waste is to bag up the poop and flush it down the toilet. Septic tanks and sewage systems use good bacteria to breakdown waste into harmless material. It doesn’t matter if the waste comes from a person or a pet – the treatment processes they use can handle almost everything. One thing that you shouldn’t put down the toilet is soiled cat litter. Cat litter is not biodegradable and can also cause damage to pipes. There are natural alternatives to conventional cat litter. Check with your local pet store, or consider making your own cat litter with shredded paper, sawdust or wheat bran. Also, some cats prefer not to use kitty litter. Cat droppings on the ground can be scooped up just like dog poop. If you use biodegradable pet litter or scoop up pet poo, then you may also want to try composting the pet droppings. There are tumbling composters and vermicomposters (worm composters) made especially for pet waste. It’s important to keep pet poop separate from food scraps and grass clippings. That’s because the harmful bacteria in pet waste are largely inactive and they will only multiply if there’s an available food source. 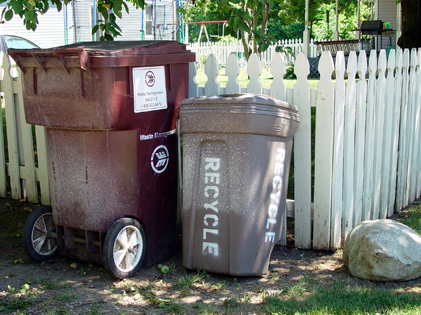 A Pet Waste Composter is effective at quickly reducing pet droppings into useful fertilizer. It’s not easy being tasty. Our search for exotic flavors has pushed many different species to the edge of extinction, and fish are in serious trouble. Fishing trawlers are catching fish faster than they breed, which means that the fish available at the supermarket are getting younger and thinner. Some species, such as Swordfish and Orange Roughy are frighteningly rare in the wild. As certain species of fish disappear from the ocean, they leave a gap in the foodchain. The things that they feed on will multiply because nothing is controlling their numbers, and the fish that feed on the missing species will be stressed as well. The biodiversity of the ocean is in jeopardy, and people who rely on fish for a major portion of their diet face starvation due to overfishing. What can you do? The Monterey Bay Aquarium has a great pocket guide to bring with you to the supermarket. This guide lists many fish that are abundant, and offers alternatives to endangered species that you can eat with a clear conscience. Greenpeace publishes a Red List of fish which should not be eaten under any circumstances. These are fish that are critically threatened by overfishing, disease, or habitat loss. There are many other fish that are in the gray area – hundreds of species are at risk but not necessarily endangered. Memorizing these lists is a bit tricky. If you have a less than photographic memory and your wallet doesn’t have room for a cheat sheet, another way you can shop for fish that are plentiful is to look for the Marine Stewardship Council eco-label. Some species that are at risk in the wild are being raised in fish farms to supplement wild stocks. Farmed fish account for an increasing percentage of total fish caught. There’s some controversy over whether farmed fish or wild seafood are more sustainable though. The footprint and operating procedures of fish farms vary considerably between different locations. Some aquaculture operations are very earth friendly, while others turn pristine shoreline into industrial farmland and introduce devastating diseases that affect nearby wild populations. It’s important to research where your food comes from and choose responsible suppliers. When most people think of pollutants, they picture ooze pouring out of factory pipes. Due to environmental regulations and pressure from consumers, almost all of these pipes have been cleaned up. Yet we still affect the environment by releasing chemicals with less immediate effects. Greenhouses gases, such as carbon dioxide, methane, and nitrous oxide are changing the way that our planet heats up and cools down. If the greenhouse effect is left unchecked, we could see drastic changes in the temperature of ocean water, reductions in ocean salinity as the polar ice caps melt, and shifts in the paths of major ocean currents (which would cause further temperature changes). In addition to climate effects, CO2 emissions can have a huge direct impact on the health of ocean life. New research suggests that salt water is becoming more acidic as it absorbs increased amounts of carbon from the air. Changing temperatures and increases acidity are some of the many factors bleaching coral reefs. Elevated temperatures increase the effect of acidity by boosting the rate at which carbonic acid dissolves calcium. Changes in the pH balance of the ocean are also affecting the metabolic rates of various animals, making it harder for many fish to breathe. That’s bad news on top of overfishing and other forms of water pollution. Even highly adaptable species like the Humboldt squid are showing changes in their behavior. Loud noises and bright lights cause major disruptions in the natural world. Animals rely on their sensitive ears and sight to evade predators and find food, yet the oceans are becoming a deafening, blinding place. All creatures have natural rhythms based on the sun and moon, day and night. These rhythms control sleep, breeding, migration, and hibernation, yet the natural rhythms are being disrupted by constant mixed signals due to human activity. The homes of many nocturnal animals are lit up 24 hours a day by beach floodlights and fishing lure lights, and the ocean is filled with the noise of motors, sonar, and mining activity. All this noise and wasted light is a serious form of pollution. Every year, we waste hundreds of millions of dollars worth of electricity on light that goes in unintended directions. Globe and acorn shaped streetlights are a prime example – they send light out in all directions, yet only 15-25% of that light reaches ground level. The efficiency of these spherical streetlights can be vastly increased by putting a simple reflector dish on the top, and replacing the light with a lower wattage bulb. Redirecting the light can save 75% on electricity costs, and it will also protect animals that are already endangered by human development. Skyglow and light trespass are also nuisances to human beings. These effects of errant light were first noticed by astronomers and other night owls, but an increasing number of people are finding that they can’t turn off the lights at night. Light pollution has a direct effect on human health, it drags down property values, and it destroys the natural beauty of the night sky. Some cities, states, and countries have started passing laws to protect wildlife from luminous pollution. These laws will likely become more stringent over time. Unfortunately, there are many sources of light pollution in the ocean, and very few of them are regulated. Every year, thousands of sea turtle hatchlings and young seabirds are killed by lights on the beach. These lights cause reflections on sand that look just like moonlight on water, disorienting the young animals and causing them to wander away from the ocean. Instead of going for a swim, baby turtles and birds are hit by cars, eaten by predators, and die of exhaustion. Reducing light pollution can save many species from extinction. Photo courtesy of Luca5 at Flickr.com. Sound pollution also kills many wild animals every year. The scale of the problem is unknown, and scientists are just beginning to study the effects of man-made noise on wildlife. Early results show that loud motor sounds can deafen animals who rely on their sensitive hearing to find food and evade predators. These noises can also drown out mating calls and distress signals. There is suspicion that navigation systems such as sonar are responsible for an increasing number of whale and dolphin beachings. High intensity sound waves can cause internal ruptures and induce symptoms similar to the bends. Water conducts sound waves much better than air does, so loud noises can travel much further in the ocean than they would on land. This is worrisome, because the noise level in the ocean is increasing rapidly. Between 1948 and 1998, the average volume of sound in the ocean increased about 15 decibels. 15 decibels may not sound like much, but that’s the difference between the amount of noise in a regular office and a busy street. So, how can we reduce noise pollution in the oceans? So, that wraps up a ‘quick’ ten-list. But, there’s one other thing you can do to save the oceans. A lot has been accomplished, but we can still do better. Comparing modern emissions to emissions from the 1970’s, is sort of like comparing a Boeing 777 to the Wright Flier – we’ve come a long way in a short period of time, and we should expect major improvements. Unfortunately, many companies are still stuck in the seventies and see nothing wrong with dumping wastewater directly into rivers that feed into the ocean. Not all of our factories and processing plants are using best practices, but it’s easy to find companies that devote resources to improving their environmental record. When you make purchase decisions at work or for your home, are you buying from companies that publish an independently reviewed environmental report card? If you can convince even one of the companies you do business with to adopt these guidelines, that will multiply the effects of your choices. Here’s a list of the a top polluters in the United States: these are companies that might reconsider their record if large numbers of customers demanded that they act responsibly to protect the oceans. Photo courtesy of HckySo at Flickr.com. Great, comprehensive list. It’s so important to keep our oceans clean! They are a huge part of our home here on planet earth. Re: your mention of protecting shoreline buffers, you may be interested in a Chesapeake Bay project where the state of Maryland is using an environment friendly dredging method to restore two islands. The dredging is placing sand back on the beach as part of the effort to rebuild them to their 1850-ish size of 1100 acres (was down to 10 in the 1990s). Environment friendly dredging uses a newer hydraulic method with precise cuts in the silt instead of invasive clamshell buckets. I used this article for writing a speech and it was really helpful! Thanx! ummmm this is good info but who is the author????????? Previous post: Shrimp, shrimp farming, and the environment. Is your meal safe?